Syria’s Permanent Representative to the UN Dr. Bashar al-Jaafari met UN Secretary General Antonio Guterres in New York and informed him on the Syrian Arab Republic’s stance in rejection and condemnation of the statements made by US President Donald Trump through which he expressed his intention to recognize “Israel’s” sovereignty over the occupied Syrian Arab Golan. Al-Jaafari affirmed that the US administration doesn’t have any right or authority to decide the fate of the occupied Syrian Golan and that any US measure that contains attacking the right of the Syrian Arab Republic in restoring that occupied land and practicing its sovereignty over it is an illegitimate act that has no effect and it is a breach of the US obligations towards provisions of the UN Charter and the international law. In this context, al-Jaafari indicated that the UN has affirmed through different relevant resolutions by the General Assembly and the Security Council’s resolution no. 497 for the year 1981 that the Golan is an occupied Syrian land and that any measures taken by the Israeli occupation authorities on this occupied land are null and void and they don’t have any legal effect. 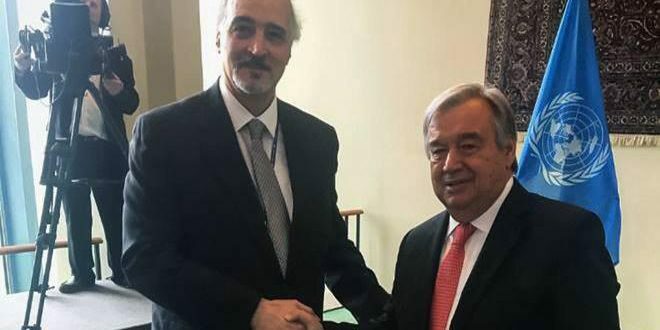 Al-Jaafari called upon the Secretary General to issue an official unambiguous stance in which he affirms the firm stance of the UN towards the issue of the Israeli occupation of the Syrian Arab Golan. He asserted that the Syrian people unanimously agree today more than ever on rejecting the US stance and confronting the Israeli occupation of the Golan in all possible means which are approved by the international law and the international legitimacy. For his part, Guterres affirmed that the stance of the UN and his personal stance are firm, well-known and based on the resolutions of the international legitimacy which expressly stipulate for that the Golan is a Syrian Arab land occupied by “Israel”. He added that despite of the his professional policy which is based on not commenting on any statements published by the social media, yet the danger of the stance issued by US President pushed him to ask the UN General Secretariat’s official spokesman to issue a statement which includes affirming that the stance of the UN is firm and unchangeable and that the Golan is a Syrian Arab land occupied by “Israel” in affirmation of the international legitimacy’s resolutions, particularly the Security Council’s resolution no. 497 which was issued in 1981. In that regard, he asserted that the statements of his official spokesman represent his stance as a Secretary General of the UN. Previous Post The Occupied Syrian Golan is Offered to Israel: Where is the International Indignation?